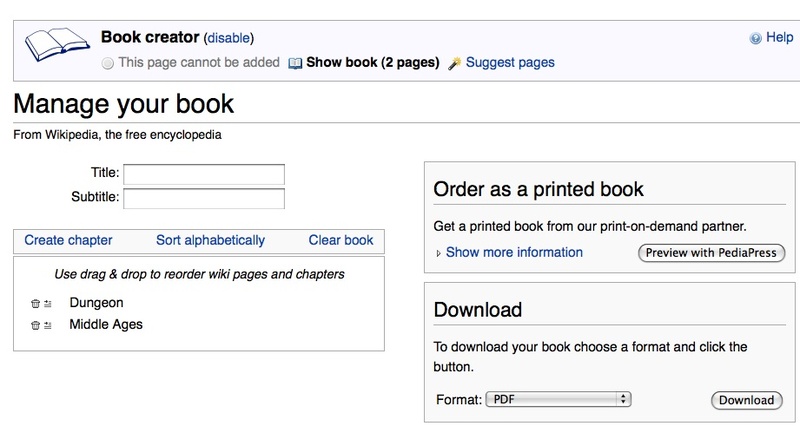 Today as I was researching on Wikipedia, I was preparing to click on the print menu on the side and create a pdf of the page to load on my kindle. When you click on the little arrow next to print you get a list of tools. You can create a book, download page as a pdf, or get a printable version. Wait a minute. Create a book? Why have I not noticed this before? Adds the currently viewed article (page) to your book. Opens a new page which will show a list of all articles (pages) that you added to your book. On that page, you can change the order of the articles in your book and structure them using chapters. Further, you can download the books as a PDF or ODF, or order a printed book. This tool analyzes the current set of pages in your book and suggests articles that might be also relevant to the overall topic of your book. 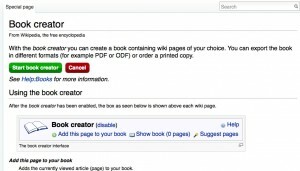 This tool allows to create books quickly. This will disable the Book creator and delete your book (unless you saved it first). A quick way to add pages is to simply hover on a linked article. 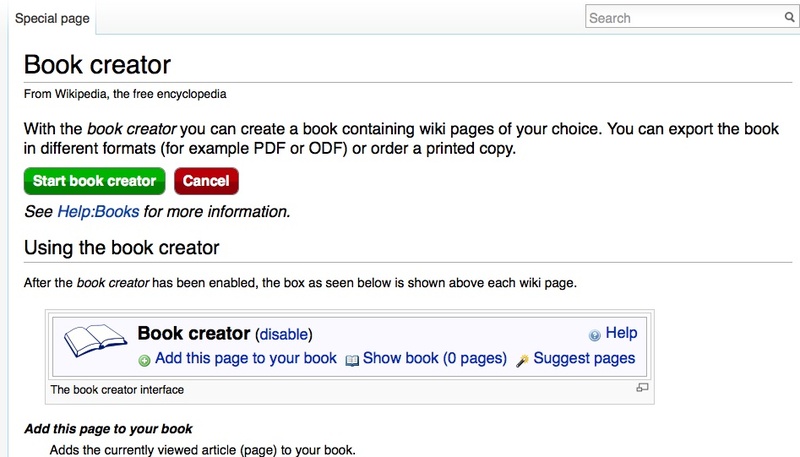 If you wait about one second, a small box will pop up with the message “Add linked wiki page to your book”. Click on this link, and the linked article will be added to your book. If you are viewing a category page, you can add all the pages in that category at once. 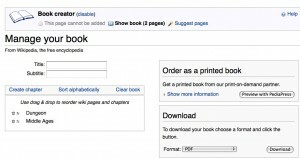 The Add this page to your book link will have changed into Add this category to your book. Click on this new link, and all the articles in that category will be added to your book. Relevant categories may be found at the very bottom of Wikipedia articles. Categories can also be added by hovering category links. Click Show Book and the following page pops up. You can tweak your title, sort your pages, preview, order a printed copy if you like, or simply download your book. Then if you are me, you convert it for your Kindle and read at your convenience. Caveat: I do not advocate the use of Wikipedia at school as teachers have very strong feelings about the website. I suppose the fact that even I can edit the site could be cause for concern but there are people constantly checking and fixing errors and misinformation. Try looking up Hurricane Katrina in the set of Funk and Wagnalls I bought when my son was born. Because Wikipedia is a massive live collaboration, it differs from a paper-based reference source in important ways. In particular, older articles tend to be more comprehensive and balanced, while newer articles more frequently contain significant misinformation, unencyclopedic content, or vandalism. Users need to be aware of this to obtain valid information and avoid misinformation that has been recently added and not yet removed (see Researching with Wikipedia for more details). However, unlike a paper reference source, Wikipedia is continually updated, with the creation or updating of articles on historic events within hours, minutes, or even seconds, rather than months or years for printed encyclopedias. You should always check more than one website when you are doing research, but Wikipedia is a great place to start. This entry was posted in Kindle, Open Source, Reading, technology, Web on June 14, 2010 by Dee. Cool news there, Ms Dee. Too many twistedknickered schoolmarms and schoolmarmens all hot and bothered about poor “little” Wikipedia. The unholy ignorance of twistedknickery academic bigotry is ridiculous. What a wondrous gift from all those Wiki-hamsters and gnomes, spinning away till the wee hours for our amusements and gratifications. As an intro to any and all things, as a quick reference to the merry and the obscure, and I do mean MERRY and OBSCURE, sheer delight. “Some” have been known to wander there for found objects for, ahem, even poems. How much uncited nonsense flows out of academic mouths all the time? And, yes, the WikiPolice are very much active and alive. A couple of my students earnestly tried to insert their birthdays into Napoleon’s bio a two years ago, and within minutes, they were slapped with Wiki-citations, in danger of losing their concocting privileges. Our high school was blacklisted for a few years after a few imaginative tykes decided to spice things up a bit. I always have to duck my head and tap my foot when I hear teachers tell students they can’t use Wikipedia as a source on a paper. I have spent some time wandering there myself and will spend more now that I have discovered the wikipedia book function.